Our Design Spotlight falls today on new GCU artist Veronica Castle who joined in April 2014 − her Zentangle designs really caught out attention. I had done pencil sketches and cover art for the children’s book The Magic World of Bracken Lea by Esma Race, but although I had seen it on the internet I had never tried zentangle until a few months ago. After buying some drawing pens at a craft fair I soon became hooked. You start out with a basic theme in mind and the pictures just grow, like Topsy; often turning out quite different to what was intended. I soon had so many that I put some designs on ebay printed onto T-shirt transfer paper, and was surprised at the response – they can be found here. 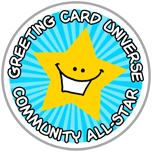 When I was asked to offer some of the designs as greetings cards I began looking online for other outlets, and discovered Greeting Card Universe. I was thrilled to be featured as “Design of the Day” early on. The advice is to try to populate categories which are short of cards, and I found plenty of Get Well wishes but not so many for carers. 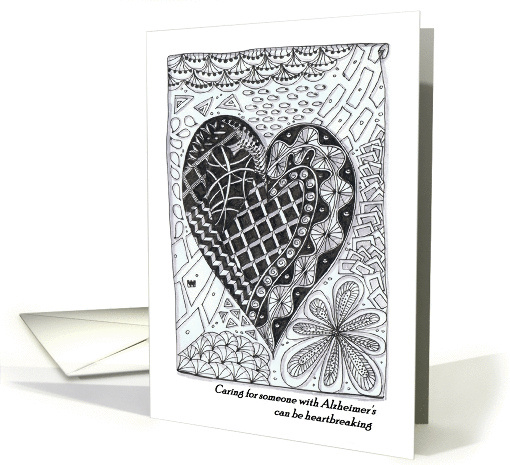 Carers make many sacrifices and often have a much harder time of it than the person they are caring for, so I targeted this category and it was the card for the carer of an Alzheimer’s sufferer which was featured. I had an idea for what I call “banner cards”, for which I am currently creating complete alphabets, a single letter per card spelling out a greeting using multiple cards. A group of people such as a family or class of children can each send one letter of a greeting such as “Get Well Soon Joe”, “Happy Birthday 30 today”, “Welcome Home”, or anything else (a sort of Group Hug), or an individual could send a card each day to a sick child. The recipient displays the cards in sequence to spell out the greeting, along a shelf or mantelpiece. I am now working on a second range of letters which are landscape-oriented so the cards can be displayed hooked over a string. GCU felt they could not create a specific category for these because they are not in a position to offer them in boxed sets for particular greetings. Instead, they suggested I put the black and white zentangle patterns in the Coloring Card category as well as Any Occasion Monogram and explain my concept in the Artist’s Notes, so that is what I have done. The cards can be left in traditional zentangle black and white, or coloured in by recipient or sender as a personal touch. When I had the idea of putting Sudoku and other puzzles onto cards, so that a paper greeting card could be multi-purpose, providing entertainment for the recipient, GCU altered the “Coloring Cards” category to “Activity and Coloring Cards” to accommodate this concept. My first Get Well Sudoku card has already sold, and I plan to add several other entertaining mind teasers as well as cards which can be cut into figurines and models such as folded boxes and badges. The e-card is rapidly becoming seen as the “green” way to send greetings, so I feel this strikes a blow for print-on-demand, recyclable, re-purposable paper cards. Veronica, Great to meet you.Your designs are wonderful! Best of luck to you with your alphabet and activity cards. What a great idea! Veronica, you zentangle cards are so interesting. I keep looking and looking and finding so much in there! the soduku puzzle card is an excellent idea. Welcome aboard! Welcome to GCU Veronica! Love your ideas and wish you tremendous success with this little niche you’ve carved out for yourself! Welcome Veronica! Your designs are mesmerizing, thank you for sharing your creativity and re-purposing ideas on GCU. You are blossoming with creative ideas! Good to note for artists reading here that it’s important for any activity cards to set your default card finish as matte vs glossy for ease of marking/coloring.